Register a user name and password (Click the "CP Mobile App" button). Need to create a user account for the first time user. You must download this app from the Windows Store on your phone. Textbooks, Case Studies, NAPLEX Reviews, & Much More..
A study tool that provide access to core pharmacy curriculum textbooks, calculators, drug monographs, herbs and supplements, case studies, multimedia, study tools including NAPLEX preparation questions, top 300 drugs flashcards, top 200 drugs challenges, and much more. Including textbooks such as "Handbook of Nonprescription Drugs", active learning exercises, NAPLEX Review, case study, etc. Drug Monographs, Natural Medicine, Guidelines, Facts & Comparison, Red Book, Manufacturers, Tools (Drug Identifier, Calculators, Do Not Crush, etc) & Much More. Clinical decision support tool that provides drug identifier, drug interaction, drug adverse reaction, IV Compatibility, drug comparison, calculators, black box warmings, drug list, confused drug names, REMS, Red Book (with drug price) and much more. A good place to find disease drug therapy. A clinical decision support tool that provide drug identifier, global drug names, drug interaction, drug adverse reaction, IV Compatibility, drug comparison, calculators, drug class overview, BEERS drug list, confused drug names, products with REMS, do not crush drug list, and much more. 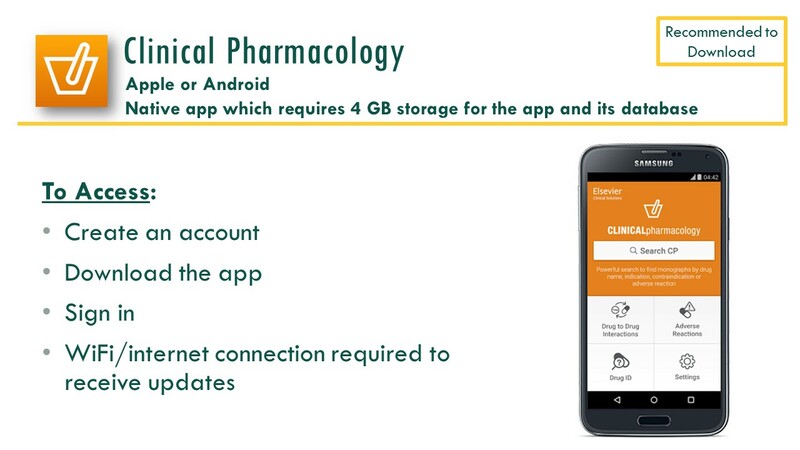 A clinical decision support tool that provides access to reliable herb medicines and supplements. Medical Literature, Systematic Reviews, Clinical Trials, & Clinical Decision Support Reviews, Guidelines, etc. NLM premier database to find biomedical literature. Provide access to biomedical and drug information plus more coverage of European literature. It is key database for systematic reviews literature search. A clinical decision support tool that provide access to evidence- and expert-based information for patient care. 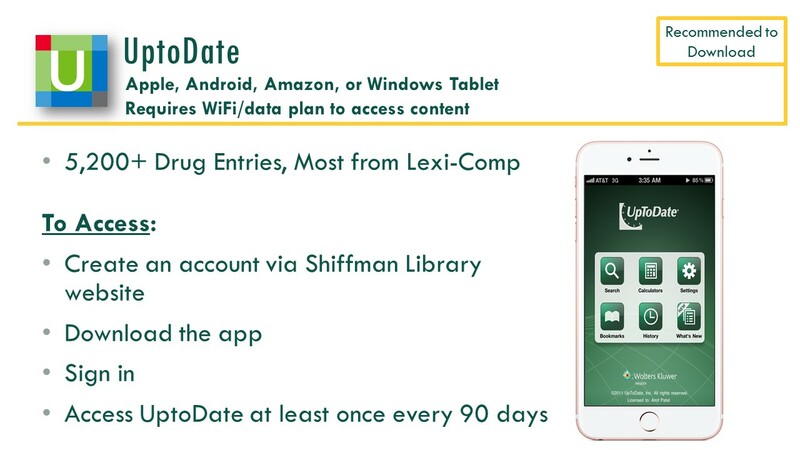 UptoDate provide access to part of Lexi-Comp drug info. A clinical decision support tool that provide access to EBM clinical information resources. A clinical decision support tool that provides access to drug monographs, clinical textbooks and journal articles, guidelines, procedures, First Consult and much more. Provide access to Cochrane systematic reviews, other reviews, methods studies, technology assessments, central register of controlled trials and economic evaluation. A world's largest abstracts database that provides access to biomedical and health sciences literature, etc. Provide an access to a comprehensive source of full text for nursing & allied health journals. The Medical Letter provides prescription drug information and drug facts.